Roughly Chop the spinach. Heat a large skillet over medium, then add 1 Tbsp olive oil. Add the chopped spinach and a pinch of salt. Sauté the spinach until it has fully wilted, then remove it from the heat. While the spinach is sautéing, stir together the breadcrumbs, garlic powder, freshly cracked pepper (5 or 6 cranks of a pepper mill), and salt in a large bowl. Lightly whisk the egg, then add the egg, ground turkey, sautéed spinach, and crumbled feta to the bowl with the breadcrumbs. Use your hands to combine these ingredients until evenly mixed. Shape the meat mixture into balls, about one heaping tablespoon each. You should get approximately 24 meatballs. Wipe out the skillet used for the spinach, add another tablespoon of oil, and heat the skillet once again over medium. Once hot, swirl the oil in the skillet to make sure the surface is coated, then add half of the meatballs. Cook the meatballs for about a minute to a minute and a half on each side, or until the meatballs are well browned and cooked through (about 6-8 minutes total). Remove the cooked meatballs to a clean bowl and repeat with the second batch. 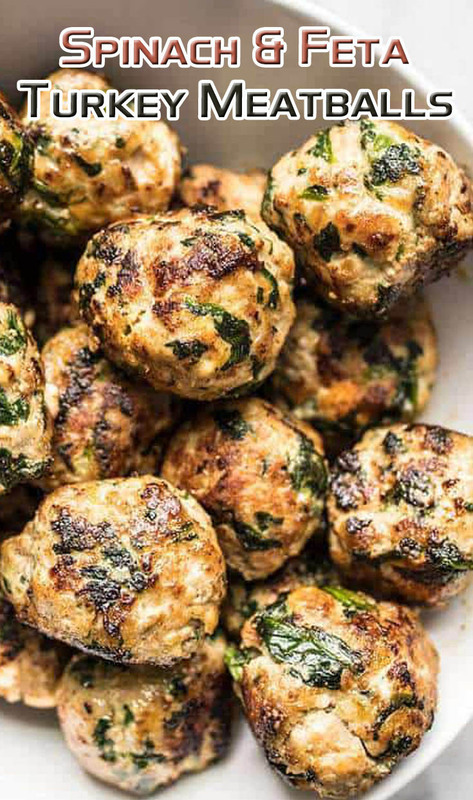 Serve your cooked meatballs with your favorite sauce, over pasta, rice, or roasted vegetables.